A diagonally crossed cannon, muzzle up and key, ward down and pointing in, surmounted by a ship’s steering wheel, all in gold colored metal; bearing on the hub a stylized star and inscribed on the ship’s wheel in Latin, above “SUSTINENDUM” and below “VICTORIAM” (Maintaining Victory) all in soldier red. Overall dimension is 1 inch (2.54 cm) in height. 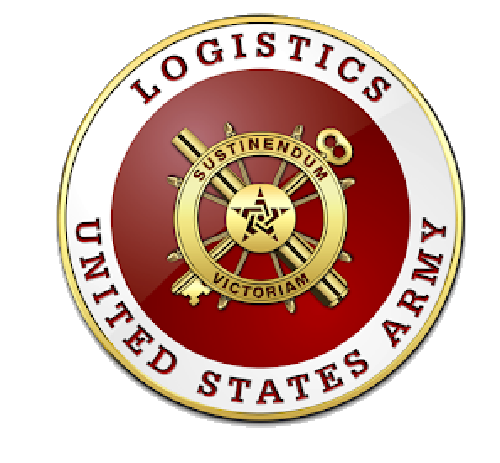 The plaque design has the Logistics branch insignia on a soldier red background with a white circular designation band edged gold and inscribed above “LOGISTICS” and below “UNITED STATES ARMY” in soldier red. There is no regimental insignia for Logistics. Officers wear the regimental insignia of their assigned functional area of expertise (secondary specialty) within the Logistics branch of Transportation, Ordnance or Quartermaster. There are no logistic units and accordingly, there are no flags or guidons. Soldier Red piped with bronze. Soldier Red – 80095 cloth; 67157 yarn; PMS 209. Bronze - 80111 cloth; 67147 yarn; PMS 874. 1 January 2008. Department of the Army General Orders No. 6, dated 27 November 2007, established Logistics as a basic branch of the Army effective 1 January 2008. This changed what was previously known as the functional area 90 (multifunctional logistician) program into a branch of the Army. All Ordnance, Quartermaster and Transportation Corps basic branch officers of all components (Active, Reserve and National Guard), in the rank of Captain or above, who have graduated from the Combined Logistics Captains Career Course (or its earlier equivalent called the Combined Logistics Officer Advanced Course) or any Ordnance, Quartermaster or Transportation Corps Reserve Component Captains Career Course will wear the Logistics branch insignia.